NOAA (the U.S. National Oceanic and Atmospheric Administration) released this image of the "Unnamed Hurricane of 1991." It depicts the storm—at its peak intensity—on November 1, 1991. NOAA Inventory ID: 2016206. Public Domain. How did the weather-information system in the North Atlantic work, when the Andrea Gail left port in the fall of 1991? In summary, data buoys and weather satellites (like GOES - geostationary satellites) transmit critically important readings to government officials who, in turn, interpret the data and fax the latest news to the boats. The time on these reports is always expressed as Greenwich Mean Time (GMT) or Coordinated Universal Time (UTC). Each buoy has a name and identification number and is equipped with sensors. One can review data from moored Canadian buoys located in the Grand Banks, including the buoy at the heart of this story - a 6-meter nomad off Sable Island. In addition to moored buoys, "global drifters" throughout the North Atlantic also transmit data. Mariners are especially concerned about wind and waves. Wind speed is gauged with an anemometer. The results are measured against the Beaufort Scale which determines the force of the wind. If winds are 55-63 miles per hour, for example, the storm is a Force 10. A hurricane, with winds above 73 miles per hour, is a Force 12. 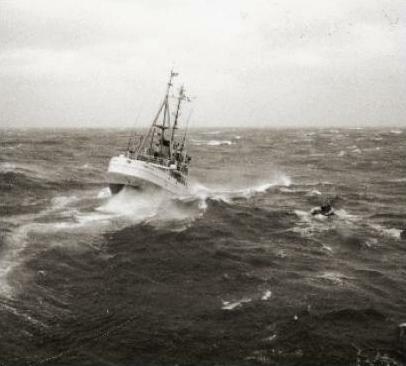 Tamaroa, a cutter owned and operated by the U.S. Coast Guard, makes her way in very heavy seas during the "Perfect Storm" of 1991. Photo, by US Coast Guard and online, courtesy US Coast Guard Foundation. Waves are described by height and length, although the buoy sensors do not directly report wave measurements. The height of a wave is the vertical distance between its crest (top) and its trough (bottom). The length of a wave is the horizontal distance between two successive crests, or troughs. Although it seems the height of a wave directly results from speed of the wind, there isn't always a linear relationship between wind speed and wave height. That's because wind speeds are generated locally but wave heights are not. Waves themselves can be generated miles away where the wind is a completely different speed. Once weather-station personnel review important data (including jet-stream analysis), they can predict if bad weather will threaten mariners at sea. The stations fax critical information directly to the ships. Even experienced and hardened crews care about the force of the wind and the size of the waves. People on board need enough advance warning to pull in the lines and tie-down equipment. One lost line is like throwing away $20,000. One loose piece of equipment, flying across the deck, can cause serious injury or death. One rogue wave can cause the most hardened fishermen to worry about its consequences. When weather gets really bad, though, it isn't enough to just rely on buoy sensors and satellite images. Sometimes trained crews in airplanes have to track storms directly. Their data provides first-hand knowledge so more lives can be saved. Bos, Carole "PREDICTING BAD WEATHER" AwesomeStories.com. Jun 01, 2000. Apr 21, 2019.